A PRIEST has described the spending frenzy and over-eating associated with Christmas as “demonic”. Father Andrew Cain from St Mary with All Souls Kilburn church in Abbey Road made the comment during a midnight mass service on Christmas Eve. He told the congregation he felt the Christian meaning behind Christmas had been virtually lost in a culture that focused on festive excess. Fr Andrew said he was not arguing against having fun at Christmas, but that it should be done within context. Fr Andrew said his sermon was inspired by an early-morning walk on Boxing Day last year when he came across a discarded tree at 9.30am. “I suppose, of course, that I shouldn’t have been saddened or surprised,” he said. “It makes sense, you see, in our culture. It makes sense that a Christmas season that starts, at latest, in October and builds into a consumer frenzy in early December should come to a crashing climax immediately after the day itself. 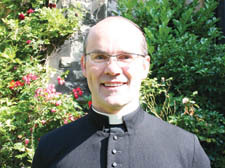 Fr Andrew, who has been at St Mary’s for 10 years and was promoted to the role of area dean of north Camden three months ago, reminded his congregation that the 12 days of Christmas begin on Christmas Day. According to tradition, the tree should be discarded on the Twelfth Night, January 6.